Despite their stinky flowers, carobs make great street trees and produce a valuable crop in many Mediterranean-type climates. They are beautiful, tolerant of dry and poor soils, pest resistant, and tidy. Carobs are legumes – like familiar peas and beans – but they belong to a different branch of the legume family (Caesalpinioideae), one that contains mostly trees and woody shrubs with tough inedible fruit (Legume Phylogeny Working Group, 2017). 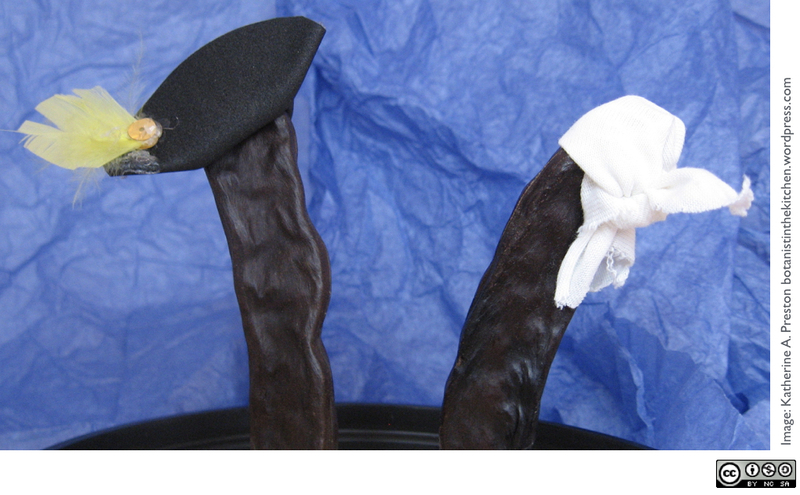 Carob pods look about as edible as Jack Sparrow’s boots, and the species’ scientific name, Ceratonia siliqua, means “horny long pod,” which well captures the intimidating nature of their leathery fruit. But as you will see below, the fruits are easy to harvest and process, and their sweet pulp is worth seeking out. 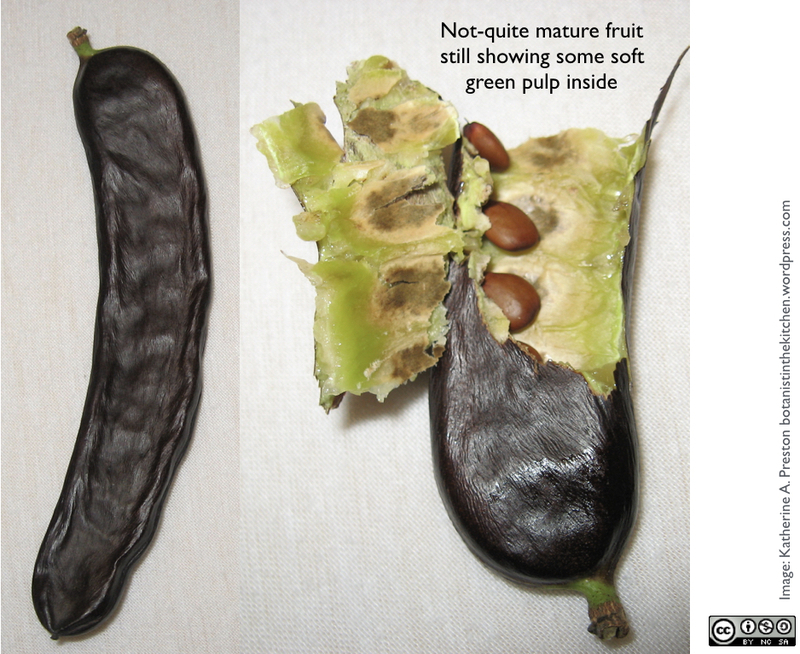 Whole carob pod (left) and immature pod opened to show pulp and seeds. The pulp hardens and turns pale brown at maturity. Click to enlarge. Evidence suggests that people have indeed been seeking out carobs for a long time. Although carob’s origin is uncertain, the species seems to have evolved in the eastern Mediterranean and wild plants would have been available to foragers well before agriculture arose in the region. The plant geneticist Daniel Zohary believed that carob was domesticated late, perhaps only in Roman times, but that it spread quickly throughout the Mediterranean region once people learned how to propagate the trees. Remains of horny pods were found in the 1st century ruins of Pompeii (Zohary, 2002), where carob trees perished alongside our noble friend Pliny the Elder. The University of Cyprus has recently embarked on a project called “Black Gold” to reinvigorate the island’s ancient tradition of carob cultivation and develop new food products from it. Right now, countries around the Mediterranean produce tens of metric tons of carob annually, and one Australian company has jumped into the market with an Aussie Sharkbar. Carob powder is derived from the fruit wall, and this is what we will process for the recipes below. A less visible but incredibly common carob product appears on ingredient lists as “locust bean gum,” which comes from the gelatinous endosperm of the seeds. It is used to thicken cosmetics and almond milk and to keep crystals from forming in ice cream. “Locust” is a common name for several of carob’s close relatives, hence the confusion, but I’m still puzzled by the marketing choice of “locust” over “carob” for a list of ingredients you might eat or rub into your face. Squeamishness over true six-legged locusts may underlie another common name for carob, “St. John’s bread.” His “meat was locusts and honey,” but surely John the Baptist subsisted on sweet tree pods and not icky arthropods. In ancient Greece and Rome, dry carob seeds provided a standardized weight for jewelry, which we now call the carat. So if your own pirate’s code precludes stealing actual gold and gemstones, you can still fill your bandana with carats of a sort. First, I must state clearly that we Botanists in the Kitchen are committed to sustainable use of wild foods and do not endorse actual pirate behavior, including stealing carob beans from private property or taking anything from parks or forests where collecting is prohibited. The interests of others and the conservation status and abundance of any plant must always be considered. Fortunately, taking a few handfuls of carob fruits before they hit the ground does not damage the trees or deprive anyone but slugs of a snack. Carobs are not native outside of the Mediterranean and anyhow they do not reproduce readily by seed, so you are unlikely to affect their propagation. And honestly, as much as I love them, publicly available carob pods are not in high demand. In fact, you may be doing your community a service by keeping them off the sidewalk. After all, the trees are planted for their foliage, not their fruits. To collect carobs, you must first find them. The Friends of Urban Forests have collected a useful series of tree maps for many cities, including several where carobs grow. City streets, public parks, and college campuses are good places to look as well. Even without a map, if you have local carobs, you should have little trouble because carobs are among the easiest to spot once you have a search image. They brandish bold compound evergreen leaves with elliptical thick green to blue-green leaflets, about 1.5 inches (4 cm) across, arrayed in pairs along a red-tinged rachis. 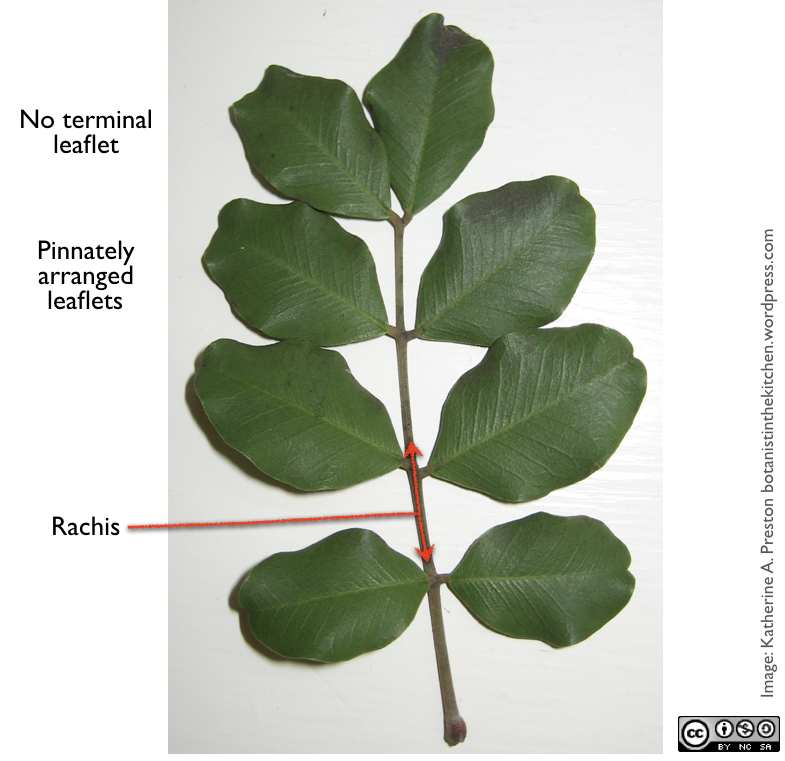 A single large carob leaf, with four pairs of leaflets. At dusk, leaflets fold up towards each other, like pairs of hands, thanks to the thick pulvinus at the base of each leaflet. Click to enlarge. Their trunks become rakishly knobby and gnarled with thick ribs running along their length. They often have low branches, making harvesting easy, and in mid-winter the black pods dangle in conspicuous clusters. Of course, during early winter flowering season you can always find them with your nose. But there is a twist in the story. Not all carob trees make pods. Ceratonia siliqua is dioecious, with some individuals bearing only pistillate (“female”) flowers and others bearing only staminate (“male”) ones. And yes, female flowers smell just as bad as male flowers do. My favorite local tree, however, is one of the occasional hermaphrodites, whose flowers bear both pistils and stamens. It is plausible that humans selected for hermaphroditic individuals during domestication (Zohary, 2002), and that my local genotype reflects that history. Inflorescence with hermaphroditic flowers. Flowers have both pistils (stigma, short style, ovary) and stamens (anthers on filaments). They lack petals, and their sepals are very short, obscured by the green nectary. Click to enlarge. Each flower in a cluster is tiny and completely lacks petals. 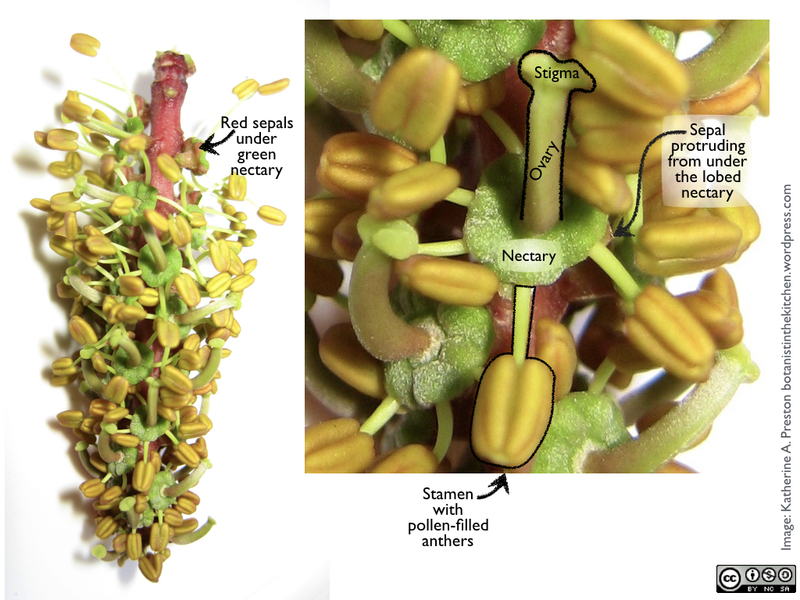 A set of short sepals is almost entirely hidden by a fat green gland that secretes odoriferous nectar to attract and reward insects. That offensive scented nectar seems gratuitous, however, because the flowers have several hallmarks of wind-pollination: highly reduced perianth (sepals and petals), well exposed anthers, and dioecy (separate male and female flowers). On the other hand, they lack other wind-pollination traits, most obviously a long and feathery stigma to capture wind-borne grains and numerous anthers tossing out buckets and buckets of pollen. 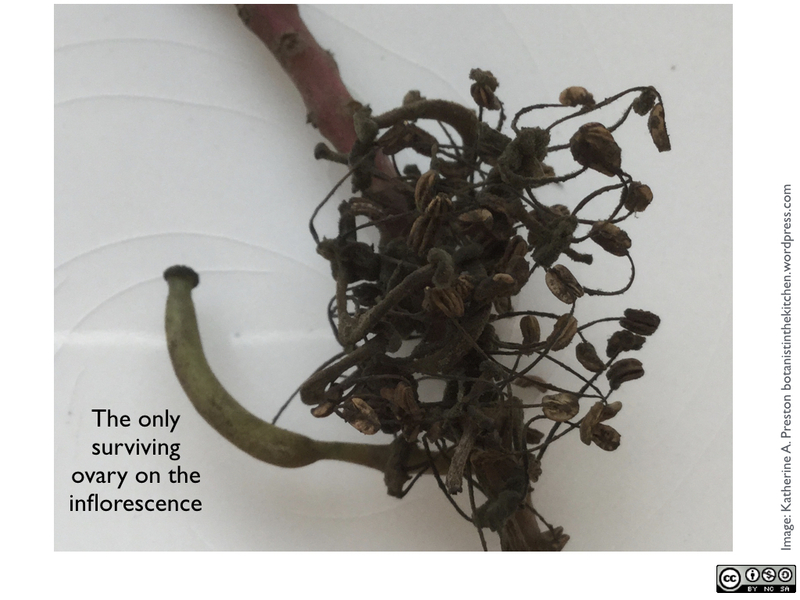 Only a few ovaries per inflorescence survive to become a carob pod. This one is happy to see you. Click to enlarge. Attracting insects thus appears to be important, and one study reports that the flowers don’t make any fruit without wasps and flies to pollinate them (Arista et al., 1999). Unfortunately, it looks like we have to tolerate the raunchy smell to get to the treasure. Nobody ever said a pirate’s life was a bed of roses. Although carob is often used as a chocolate substitute, and it does taste similar to cocoa, carob has a unique flavor profile that deserves to be taken on its own terms. The flavor can be enhanced by roasting the pods gently for about 10 or 15 minutes. Roasting also turns residual moisture in the fruits into steam, which swells the cavity inside so that the seeds come out more easily. It’s more fun to make your own, but you can find commercial carob powder in many stores, and both powder and syrup can be found online. Use about 5 pods per cup. Roast pods in a toaster oven at a low temperature (about 250ºF or 120ºC) for 10-15 min until they swell up and blister slightly. Their high sugar content makes pods burn easily and deeply, so keep a watch on them and remove them quickly if they start to char. Crack open the pods and remove all the seeds. Grind the pods in a coffee or spice grinder to the consistency of ground coffee. 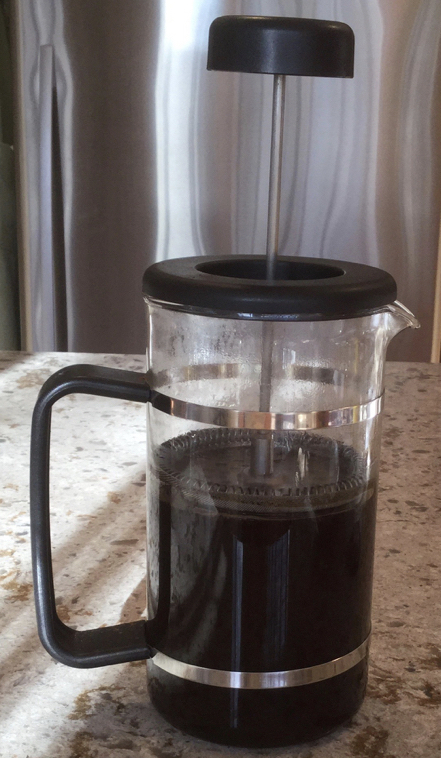 For rich flavor, I like to use about half a cup of ground carob in a 4-cup French press to yield two hefty mugs. Brew for about 15 mins. Add heated or steamed milk to taste. Use to sweeten tea or coffee or to make carob-peanut balls. You will need about 8 pods and two cups of water for every tablespoon of syrup desired. Pods do not need to be roasted, but allowing them to dry out for a week reduces the tannins and yields a smoother flavor. Rinse any dust from the pods. Remove “stems” (pedicels). Hand break the pods into 1-inch lengths or roll over them with a marble rolling pin or a thick-walled wine bottle to crack and crush them. Pirates can use a bottle of rum. In a sauce pan, bring to a boil one cup of water for every 4 pods. Remove from heat, add the broken pods, cover and allow to steep for several hours, until the water is the color of iced tea. Reheat the water and simmer the pods for another 30 mins, or until the liquid looks like breakfast tea or very weak coffee. Remove the pods and continue to simmer the liquid extract until the depth of the water is about half an inch. At this point, right before it is thick enough, the syrup can burn very easily. For the final reduction, either strain it into a small sauce pan and heat gently under constant vigilance, or strain it into a glass measuring cup and microwave it a few minutes at a time. You will know it is ready when it has been reduced in volume to half a tablespoon per cup of starting liquid. It will thicken a bit when it cools, but will always be more like maple syrup than molasses. Refrigerate for storage. Peanuts and chocolate are a classic combination, but peanuts and carob really belong together, as they are in the same family. If you can’t make or find carob syrup, you can use clover honey instead and sort-of add a third member of the fabulous Fabaceae. Roast and grind 2 or 3 carob pods, as described in the mocha recipe above, but continue to grind to make a very fine powder. Put the powder through the finest sieve you have to remove grainy bits. A gold filter for coffee or a very fine tea strainer works well. The leftover grainy bits can be steeped for tea. Mix a tablespoon of powder with about a teaspoon of carob syrup (or a bit less honey). In a coffee grinder or mini food processor, grind a half a cup of whole peanuts into smooth peanut butter. Add salt to taste. Add the powder and syrup mixture and blend to combine. Allow the mixture to sit for an hour as the powder binds with the peanut butter. Roll mixture into about a dozen small balls. Roll the balls in carob powder to coat them. You may need a second coat if they become sticky. 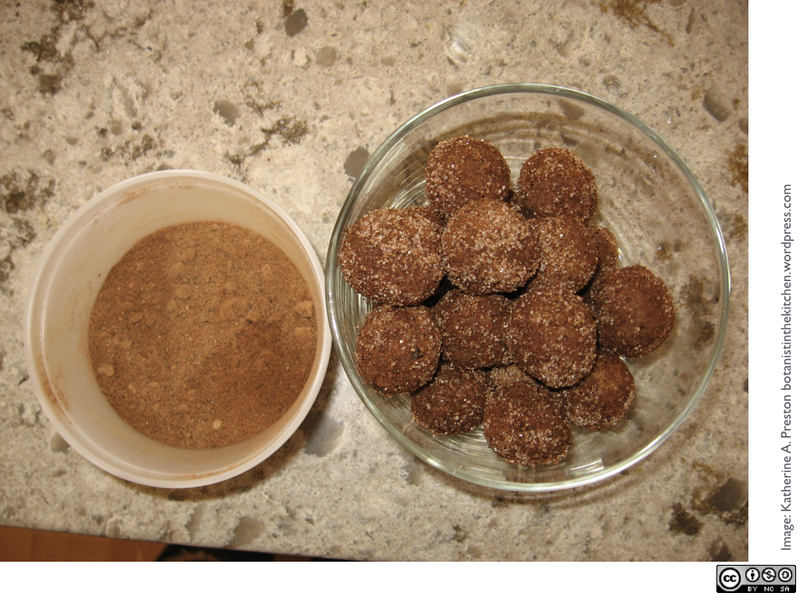 Carob peanut balls (right) and carob powder (left). This batch was rolled in sugar for some sparkle. Sugar is not necessary for taste because carob is naturally sweet. Arista, M., Ortiz, P. L., & Talavera, S. (1999). 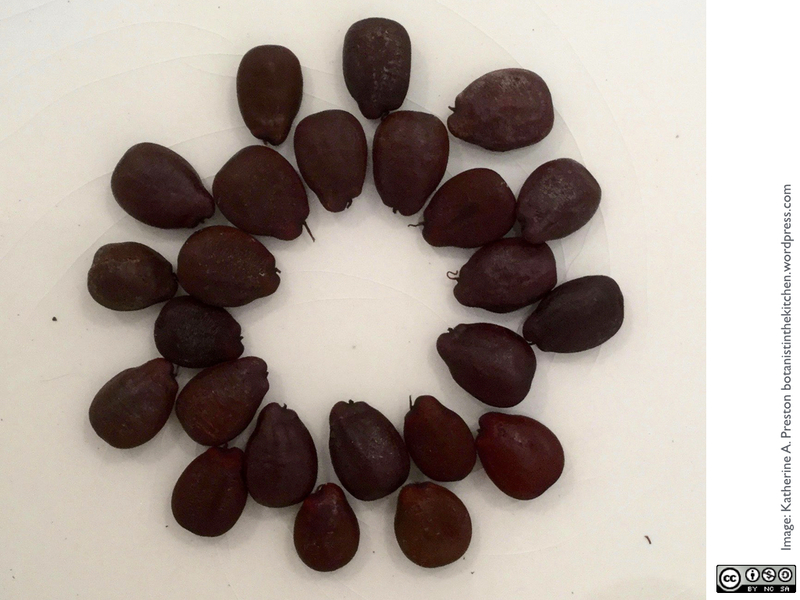 Apical pattern of fruit production in the racemes of Ceratonia siliqua (Leguminosae: Caesalpinioideae): role of pollinators. American journal of botany, 86(12), 1708-1716. Custódio, L., Serra, H., Nogueira, J. M. F., Gonçalves, S., & Romano, A. (2006). Analysis of the volatiles emitted by whole flowers and isolated flower organs of the carob tree using HS-SPME-GC/MS. Journal of chemical ecology, 32(5), 929-942. Legume Phylogeny Working Group (LPWG) (2017). A new subfamily classification of the Leguminosae based on a taxonomically comprehensive phylogeny The Legume Phylogeny Working Group (LPWG). Taxon, 66(1), 44-77. Zohary, D. (2002). Domestication of the carob (Ceratonia siliqua L.). Israel journal of plant sciences, 50(sup1), 141-145. This entry was posted in Flavor, Fruit, Recipes, Uncategorized and tagged fruit, Katherine Preston, recipe, spice. Bookmark the permalink. I’m Deeply gratefull for light up the gorgeus and complex relations between food, nations and beeings. A delightful post, as always. I very much wanted to believe the story about John the Baptist eating carob pods in the wilderness. However, the homonymy of ‘locust’ (insect) and ‘locust’ (plant) works only in English, it appears. In the original Greek of the New Testament Bible, Matthew (3:4) uses the term ἀκρίδες (akrides) to refer to locusts, and this word means only ‘grasshoppers’. A contemporary Greek word for carob would be κερατωνία (keratonia), i.e. the genus name for carob bean. I had to do a little sleuthing to figure this one out, and I thought you would like to know. Keep up the interesting blog posts! Thanks, Nic, and thanks for adding those details. I had stumbled across that same reality check on the story but decided not to go into it here. With your comment, readers now have a fuller picture. It’s easy to believe that the association with carob was wishful thinking. Also, a gem of a post. Thanks for all of the details and humor. Also, also, a gem of a blog. Glad I stumbled across it. I subscribed with my RSS reader. I’d buy your book if you published one. Thanks, Tait! A book is a long-time goal. We planted a dozen carobs about 4 years ago and hope to have our first pods this year. Seem to do better on limey soils. In our acidic soil they need to be limed to thrive. Carob is an important crop and i think that you misread the production figures – the leading countries each produce tens of thousands of metric tonnes per year. “From November through January, the carob trees in my neighborhood dangle hard, lumpy, dark brown fruits resembling lacquered cat turds.” Must be one of the best introductory sentences ever, for a food blog! Fascinating and well written, keep up the good work!